The visitor and the host are two significant archetypes of humanity. If traveling from one place to another, giving and receiving can be understood in a metaphorical, mythological, mystical, symbolical or profane sense. Giving and receiving can happen even if no commodities are exchanged. You give and receive energy, power, feelings, wisdom, ideas, knowledge and inspiration. In past times traveling or wandering was a significant way of collecting wisdom – wisdom to be acquired ‘live’ from life. From the profane Wandergesellen (i.e. wandering artisans out on the road, or auf der Walz as it was called in Central Europe in the past) to more spiritually-minded seekers of wisdom of life. They were sent to all corners of the world to collect what was not available in the vicinity. Today such a setting has almost disappeared. Artists are the most mobile and flexible tribe of today’s humanity seeking inspiration how to code or decode the visible or the invisible. The house, the tent, these are places where we look for shelter, places where we invite the one who comes from far or near. Increasingly, today’s humanity live in cities, where gigantic houses are built to accommodate them and their activities in a more “static life”. Artist studios, art exhibition venues are places which we visit to see and experience something which is outside of our “static life”, something which stretches between the profane and the profound. This is the third time that the Austro Sino Arts Program organizes a contemporary art show in Beijing, the first was "mifan" in 2009, then "dabao" in 2010 with more than 30,000 visitors in a month. 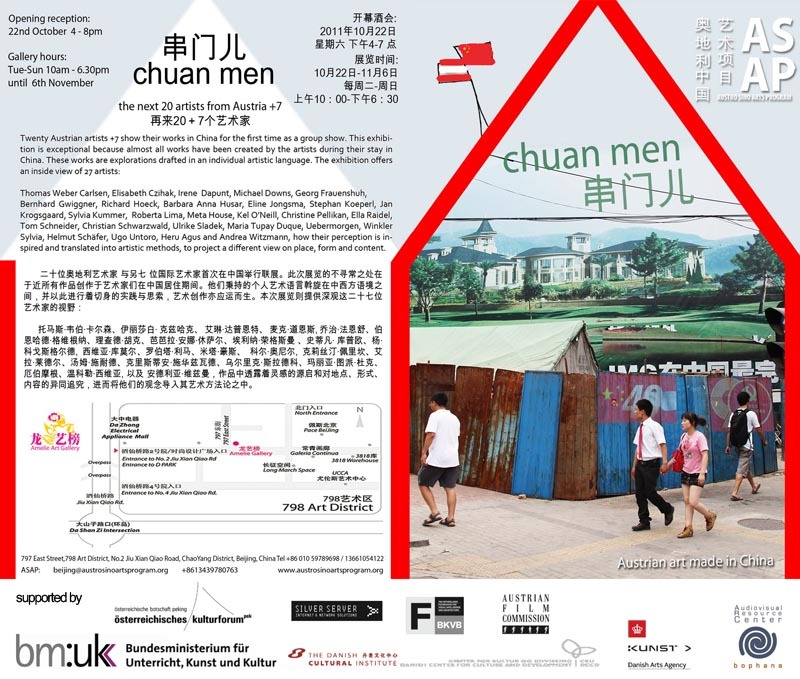 In 2011, twenty Austrian artists +5 show their works in China for the first time in the frame of a group show. In this year’s exhibition, ASAP is including works of artists from other countries – "+5" – from Germany, the Netherlands, Denmark, Cambodia, Indonesia, the USA and Australia. Most of the works in this year’s exhibition have been created by the artists during their stay in China and other artists created their works out of local contexts, with history and today’s society. These works are studies, drafted in each artist's individual language. Thomas Weber Carlsen and Jan Krogsgaard will present their videos, Khmer Rouge people speak their minds and feelings; Elisabeth Czihak has captured in her photos the remains of demolished buildings and juxtaposes them to strict geometric drawings inspired by the “endless line” of Chinese windows; Irene Dapunt’s large paintings are full of private metaphors and messages; Michael Downs digital collages are strong colorful patterns made with today’s tools; Georg Frauenschuh collects and draws his ideas about the unknown and what he will paint, build and understand in the future; Bernhard Gwiggner sequences the Tao doctrine in hundreds of drawings, t and translates it into a Western language; Richard Hoeck’s materials come straight out of shopping windows, he turns the usual views, the desires of commodity dreams upside down; Barbara Anna Husar enlarges China’s mythical creatures of the past in her big paintings on rice bags ; Eline Jongsman and Kel O’Neill document the bizarre living remains of past empires; Stephan Koeperl and Sylvia Winkler have chosen pharmacies for their musical stage, they sing and a mobile phone is their instrument; Sylvia Kummer’s drawings and writings on leather skins are like traces, rolled, becoming sculptures from an unknown tribe; Roberta Lima’s is a CCTV’s video, traveling the space of her privacy; Meta House will show the life of women workers in Cambodia in 4 short movies ; Christine Pellikan, inspired by traditional Chinese art techniques, uses in her rolling pictures paper and ink in her own way; Ella Raidel embarked on a research into Chinese soap operas as a sociopolitical space; Tom Schneider will show a short movie decoding his view of the locality; Christian Schwarzwald constructs a wooden wall and enlarges the notion of frame and image; Ulrike Sladek’s text and audio work accompany the crystal clear photos of Andrea Witzmann; Maria Tupay Duque’s drawings are emotional scores where she translates music and motion; Uebermorgen pick up on virtual craftsmanship being either exploited in prisons or in dark video game caves, building virtual fighting gear for online gamers. Twenty Austrian artists lived in China, became accommodated to habits and rituals, memorized and translated this into videos, movies, drawings, sculptures, photographs, texts, concepts of their artistic expression. For some it was a momentary configuration, for others a live changing experience. „The Austrians are back“. This was the title the Chinese newspaper chose on the occasion of ASAP’s last year’s “Da Bao” exhibition at 798 art district. As Austrian Ambassador to China, I am particularly delighted, that in 2011, when we are celebrating 40 years of diplomatic relations between Austria and China, we will yet again have the opportunity to marvel at the work of 25 artists from Austria and other countries at Dashanzi Art District. Everybody is aware of Austria’s rich cultural heritage. Artists like Mozart, Klimt, Strauss or Kafka have contributed to our very positive image here in China and throughout the world. As embassy we see our mission in bringing more contemporary art “Made in Austria” to China. While being very proud of the achievement of the past, we are also eager to enable our Chinese friends to get an idea of the vivid creativity of Austria’s arts scene of today. After the very successful event “Mifan” in 2009 and last year’s “Da Bao” exhibition with 30.000 visitors, ASAP brings its third group exhibition to Beijing. 25 artists, who all lived in China for some time, will show how this incredible experience impacts their work. The result is truly exceptional, as almost all works have been created here in China, expressing memories in videos, movies, drawings, sculptures, photographs and texts. I sincerely hope that the success of the past years can be repeated, and I am looking forward to seeing the Austrians come back soon!